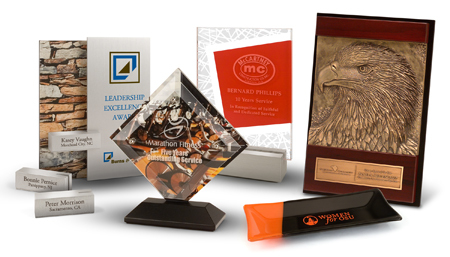 The belief that special achievement deserves special recognition has led Advance Award Line into being an industry leader in the designing and manufacturing of recognition awards and corporate gifts. Recognition and rewards are more important these days than ever. We manufacture standard and custom awards and trophies for years of service, safety, sales achievement, quality achievement, employee performance, outstanding achievement volunteer recognition as well as awards for all occasions where it is essential that recipients are remembered and honored. Patient plaques and donor recognition walls are ideal ways to celebrate accomplishments and commitment, which provide a lasting impact. A recognition award from Advance Award Line will show the care you have taken to provide a special remembrance for a special achievement.